After fishing the Arizona Wild Trout challenge, I was eager to find similar programs that could teach me about native trout species. One that stuck out to me was the Utah Cutthroat Slam because I had never fished for any cutthroat species before. 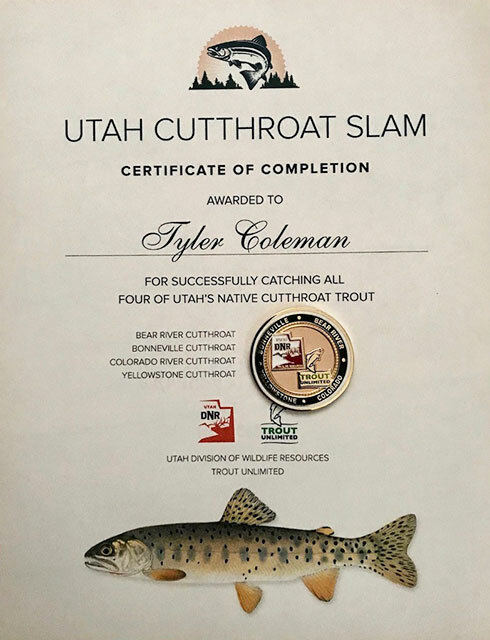 The goal of the Utah Slam is to catch the state’s four native subspecies of cutthroat in their historic range. 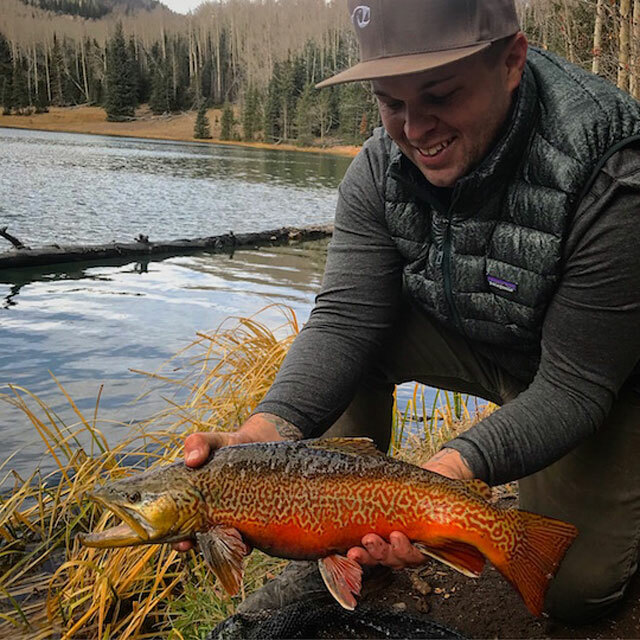 It took a while for things to come together, but when a good friend invited me to come out and fish Utah with him, I jumped on the opportunity. 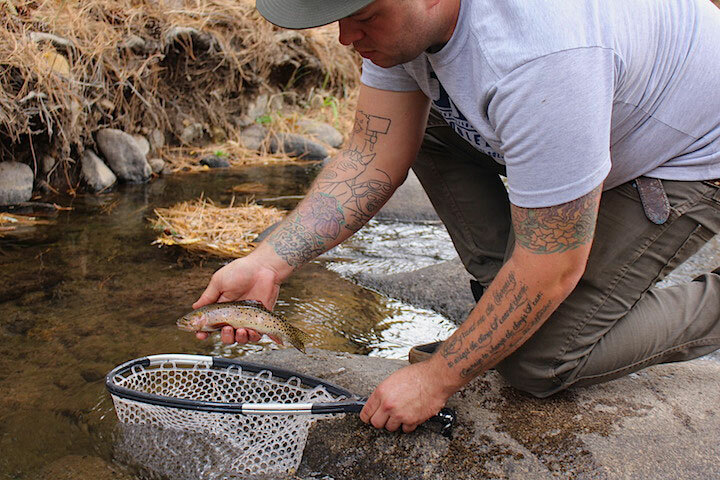 Anthony Guerrero is a Las Vegas local who is just as addicted to chasing native trout species as I am. He had read my Arizona Wild Trout Challenge posts, and we became social-media friends who talked a lot about our love for these fish. He linked up with a few of my friends from Arizona, and we began planning a trip to fish together in the future. Finally, I found myself at the Las Vegas airport wandering around three levels of confusion, hoping to find a friend I had never met in person. We started off by making a brief detour through Arizona to meet up and fish with my good friend, Ricky Furbee. 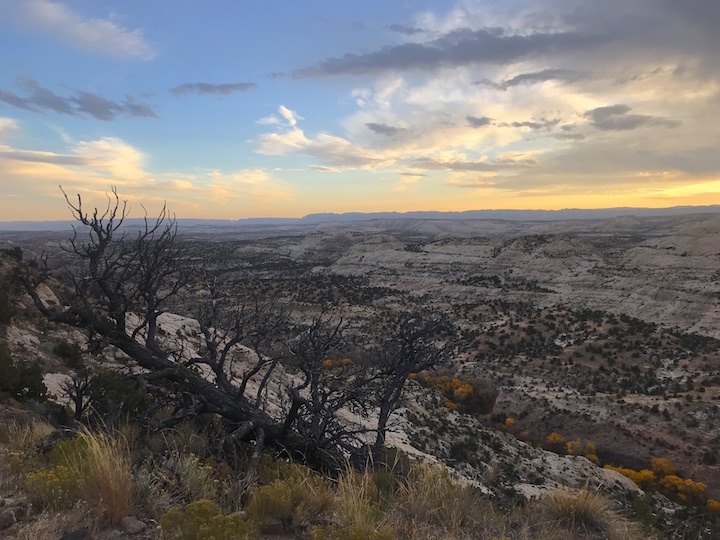 However, the intention of this trip was to focus on the Utah slam, so we made our way to a small mountain range in southwestern Utah, where we planned to camp for the first subspecies on the list. As we drove down the moonless dirt road into what seemed to be the middle of nothing, all I could think of was a warm fire and getting some rest. But after the car came to a stop, we headed straight to the sound of tumbling water. With only a small headlamp and cell-phone lights, we checked out the pool close to camp, which fueled our excitement for the next day. After a few cold drinks and food by the fire, I climbed into my tent and fell asleep almost the moment I zipped up my sleeping bag. 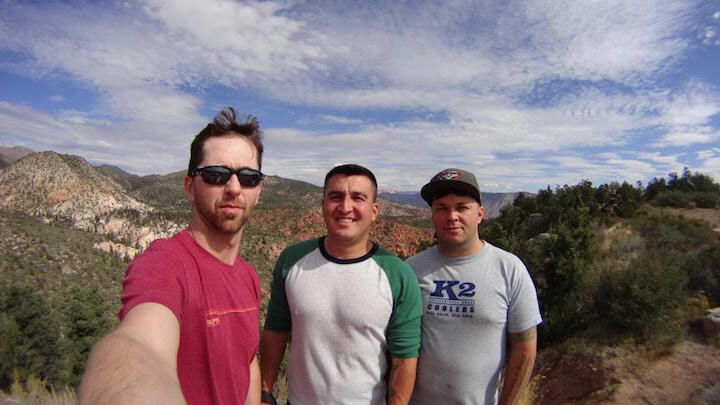 Ricky, Anthony, and I heading into the arid mountains in search of trout. The next morning, anticipation of our first Bonneville cutthroats was all the wake-up call we needed, so we skipped coffee and went straight to rigging up our rods. After a few minutes of walking, we spotted the surface rings of a rising fish and set up to get the best angle to present a fly. Of course, the excitement of the perfect situation got the best of me, and my hopper was soon tangled in some grass rather than being eaten by the fish. Luckily I was able to crawl down to retrieve the fly without blowing up the spot and got my second cast right where it needed to be. I watched the small cutthroat aggressively confuse my fly for an easy breakfast and then I felt the bend of my fiberglass rod. I scooped the fish up and was relieved to know that the rest of this day would be completely about enjoying my time on the water. The first spot was not the only one that was holding hungry fish, and as we continued up stream, everyone caught his fair share. Everyone was pretty happy with how the day had gone so far, and we decided to head back into town for some lunch before driving to the next spot. On our way out, Ricky and I got to see what we had missed on the dark drive the night before—a large mountain range with amazing views. My first cutthroat, a Bonneville, step one on the Utah Cutthroat Slam. Southern Utah has some pretty incredible places, and our next subspecies was right in the middle of a handful of them. The drive on Highway 12 through Dixie National Forest, Bryce Canyon National Park, and past Escalante-Grand Staircase National Monument was far more impressive than I was expecting. I had heard how beautiful this area was but words cannot paint the picture properly. I was glad Anthony was behind the wheel, so I could rubberneck the whole time and take photos. Utah is one of my favorite places I have been. The smooth sound of the tires on a fresh asphalt road ended as we headed up mountain to our next stream. This water was similar size to the previous spot but the scenery was completely different. The previous desert mountain was replaced by the pine trees of Boulder Mountain. Wild turkeys crossed the road, deer paused in caution as we drove by, and cattle stood in the road as if we were in their way. We found a place to camp for the night, got geared up and headed off looking for Colorado River cutthroat trout. This Colorado cutthroat was subspecies number two off my list. Even though the temperature and scenery had changed, the fishing was about the same. We found ourselves throwing dries to eager fish and before long we all had another subspecies checked off our list. The original pressure of completing the slam seemed to have faded, and I began to get distracted by my surroundings. Instead of going back to camp we decided to go further into the mountains and check out a reservoir said to hold large brook trout. We ran short on daylight but got a few casts in watching fish run down streamers, but nothing made it to the net. As the sun set, the temperature dropped dramatically. The frigid cold, difficult fishing in eerie darkness, and the sound of angry territorial beavers sent us back down the hill to camp. We woke up and said goodbye to Ricky, who had to head back to Arizona. Anthony knew I had been wanting to fish for tiger trout, so he suggested we hike up to a reservoir that held tigers and brook trout. After a nerve-wracking battle I caught my first tiger, and a dang nice one. Anthony had caught some nice brookies, we both lost some good fish and on the hike out we both caught a few rainbows. On our way out of the mountains, we celebrated with some food in a small town, and then headed north towards the next fish on the list. It’s not on the Slam, but this cool tiger trout was another thing crossed off my life list. 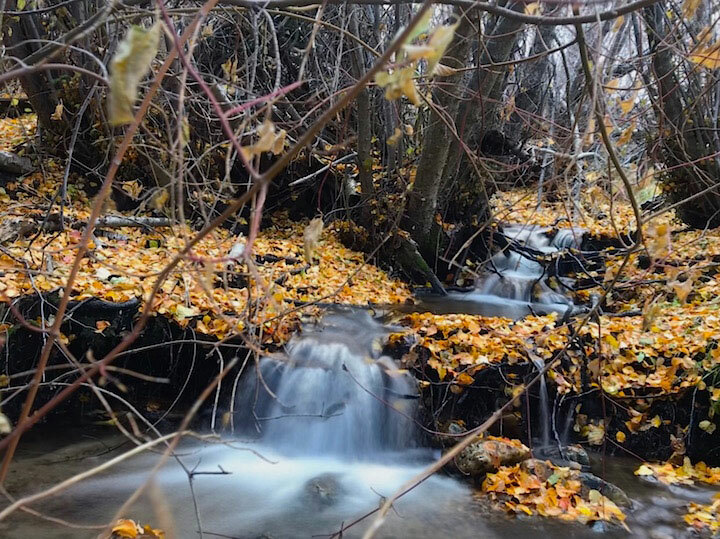 As we made our way into the Wasatch-Cache National Forest, I couldn’t help but smile each time I was greeted by signs that said “Now Entering Your Public Land.” The area was swarming with people, but lucky for us they were only interested in deer season leaving the Bear River cutthroats trout to us. The stream flows through a rolling meadow with a plentiful population of hoppers. We spotted some fish early on, but the low clear water gave them the upper hand. Anthony headed upstream to check out a spot we had heard about, but I couldn’t stray from a small pool where I spooked a 14-inch fish. I walked downstream to take in the view and let the pool rest. After a while, I crept through the tall grass, positioning myself in a spot where I could get my fly in front of where I had seen the large fish. False-casting to a previously spooked trout was too risky, so I set up for an uncomfortably long bow-and-arrow cast. Right as my hopper landed, it was submerged by a quick take. I watched as my line tightened and headed straight under the overhanging bushes, so I quickly got to my feet and applied pressure to the fish in the opposite direction. Even with my speedy reaction, the fish was able to tangle up on some fallen branches. I was able to grab one of the branches and pull it towards me, starting the fight where it left off. Finally, the fish was in the net and I realized that it was not the one I had originally seen but still of good size. I snapped some quick photos and released the trout back into the pool. Anthony had found a few eager cutties without me, and we fished our way up stream landing a couple more before the hike out. 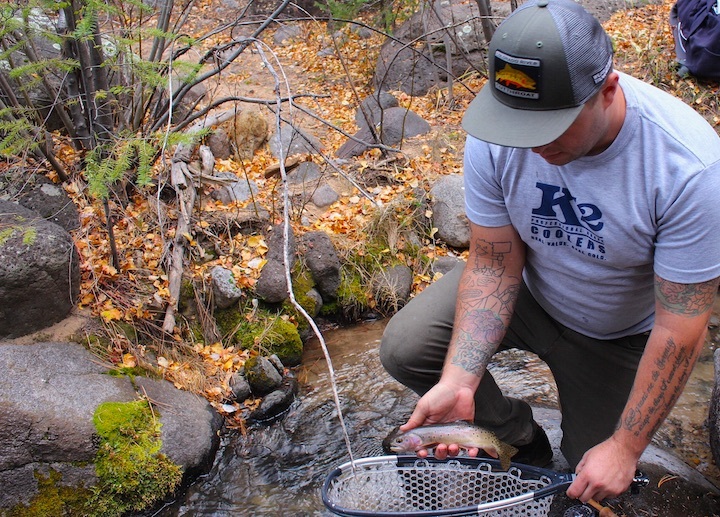 Anthony sends a Bear River cutthroat back to its home. Sleeping in a bed was a little too comfortable, so we missed our wake up call by about an hour the next morning, and we hopped in the car for the trip to the Raft River Mountains for our last day of fishing. Anthony had warned me that this last spot could be tricky because the stream is so small, and he was completely right. We passed multiple cars stuffed with people in orange and camo on our way into the mountains. Deer season was bringing a lot of traffic to an otherwise quiet area. 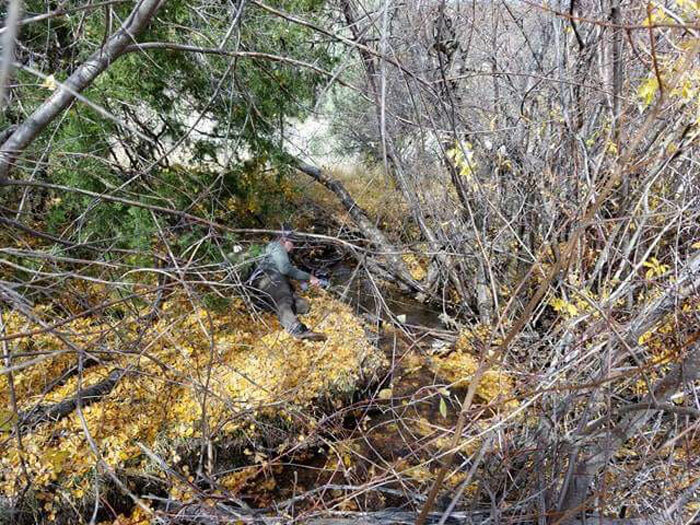 When we drove over a culvert trickling with what looked like some runoff, Anthony pulled to the side of the road. I asked why we stopped, and he told me this was the spot. Pictures online couldn’t prepare me for just how small the creek was. 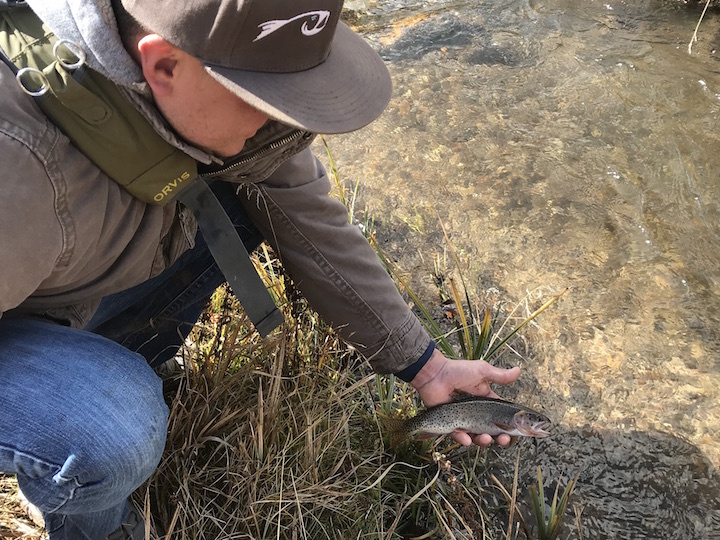 I knew I would be spending a lot of time on the ground if I wanted to catch my first Yellowstone cutthroat and complete my slam. 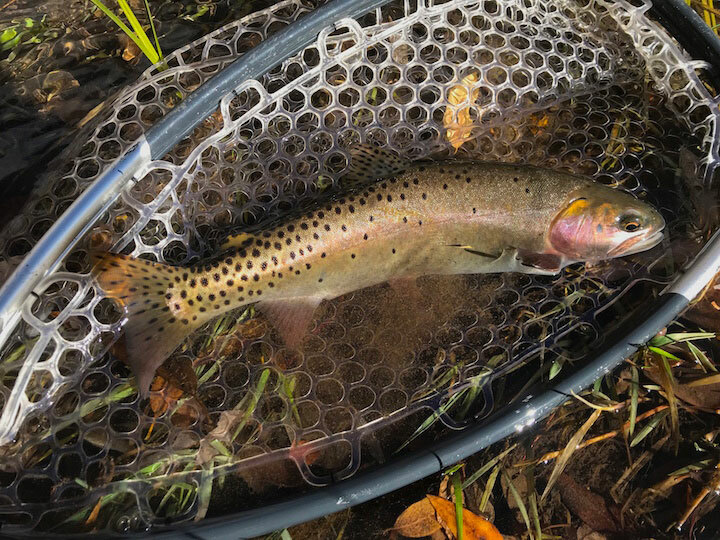 Although genetically very similar to the Bonneville subspecies, the Bear River Cutthroat gets its own place on the list. Right off the bat we saw a fish that didn’t even look like it could survive in this size water. Small stream trout have an amazing ability to hold in the smallest of pools and survive low water. Typically if you can see the fish, they can see you, so you’re better off sneaking up on the next ones. The large fish ran downstream never to be seen again, which prepared us to being stealthy the rest of the day. This area was no joke for technical fishing, and it took me a while before I got it together and put my fly in front of some fish without spooking them. After losing a few, we found a nice-looking pool with no clear shot for even a bow-an-arrow cast. Anthony and I crawled under a tree and I lay sideways, pulling back my fly to shoot it into the water. The plan was that if I did get a fish on, I would pass my rod back to Anthony while grabbing my line and scooping up the fish with my net. It sounds pretty good when I type it out like that, but the reality was a little more hairy, involving tangled line, tree limbs and some inappropriate language. As this fish entered my net, the feelings of accomplishment and appreciation were overtaking. The trip was a success, and I couldn’t help but think about the bigger picture of how much I just enjoyed being in the mountains for the last 4 days. Anthony some how managed to lose a big one twice then land this one in the same spot. This trip was supposed to be about a challenge, but it never really felt like one. 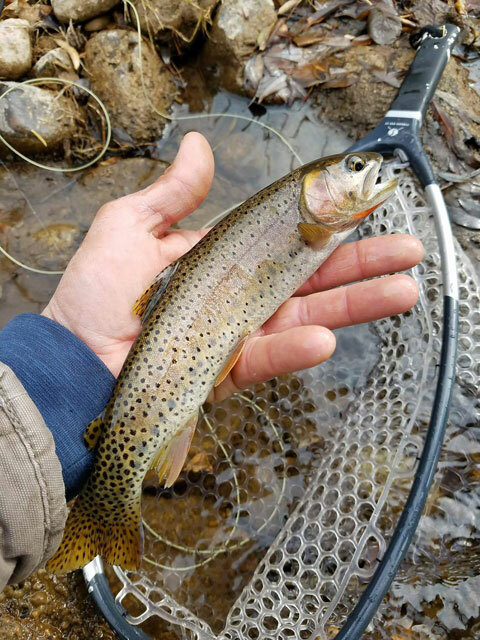 The fishing was tough at times, and I lost a lot of good trout, but being back in the mountains meant more to me than they ever could. The old saying you never really know how much you love something until it’s gone hit home as I boarded my plane back to Michigan, knowing it would be a while before I was surrounded by such great sights. This was the first time I really understood just how much I would miss being out West in search of wild trout. 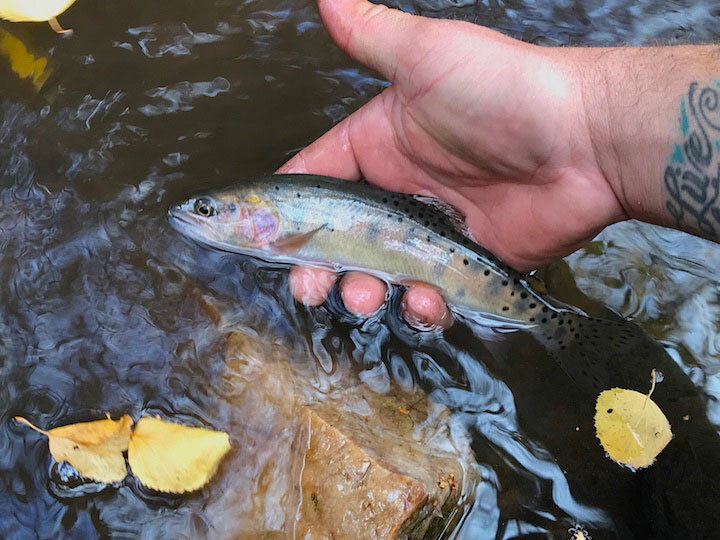 A big thanks to Utah DWR, Trout Unlimited, and Western Native Trout Initiative for their involvement in protecting these great native trout, so people like me have the chance to see them in real life. 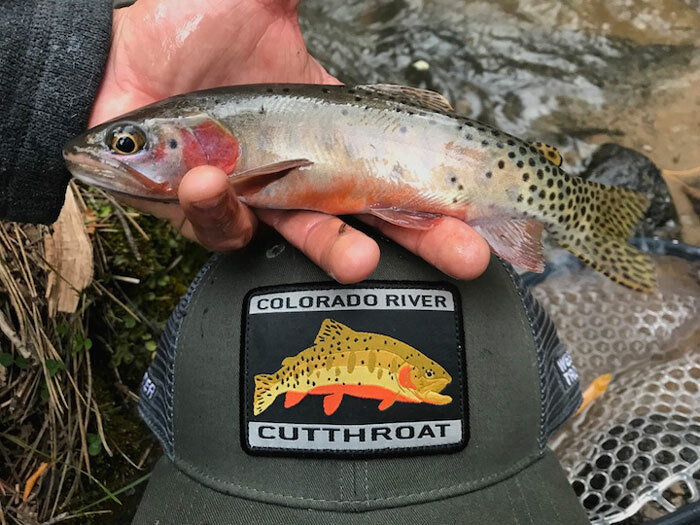 If you haven’t had a chance to check out the Utah Cutthroat Slam, take a look at their website. Tyler Coleman recently moved from Arizona to Michigan. Check him out on Instagram at @thecolemancollection. He is a frequent contributor to this blog. Tiny waterfalls marked this minuscule water where we caught Yellowstone Cutthroats. 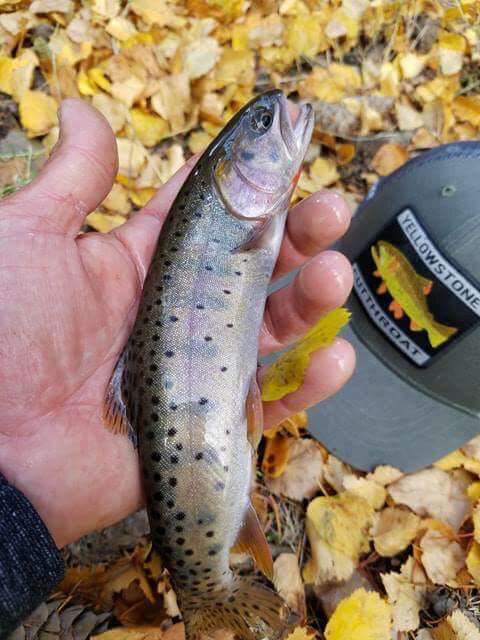 My slam was completed with this little gem of a Yellowstone cutthroat. It took some work getting a fly to these fish. Anthony landed a monster (for this stream) to complete his own slam. This great certificate and medallion were the icing on the cake of a great adventure.